I am uploading the rest of the pictures that I couldn't fit on the first one here. The text copied. I was inspired by your website! I gleaned so many great ideas and hints to help me throw an amazing baby shower for my friends that people are still raving about! I thought that since this is a "cake" why not make a recipe card to go with it? I am attaching the recipe card as well, which I had lying next to the cake so that guests could look and see what all made up this gorgeous non-edible delight! I followed the instructions from your site to build it and added my own little baby items to decorate it. I put the baby sock roses, another idea from your sight, on the diaper cake. I also made a letter centerpiece for the baby's room like the one that you have linked on your site. The theme of the nursery is children's literature; so I went with a fairy tale scrapbook page to decorate the letter. The mother-to-be could not stop saying how perfect it was and how much she loved it. 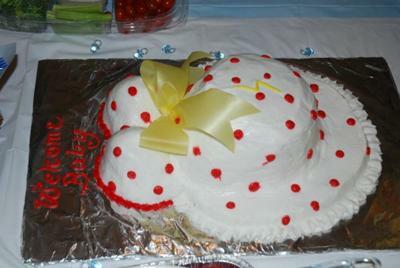 It served as a great decoration at the shower, and will be one of the main focal points of the baby's room! I am attaching pictures of a fruit centerpiece that I made for the food table as well. I got cookie cutters in a baby theme to cut out the pineapple shapes. A friend of my family made an edible cake in the shape of a pregnant belly (she added a lightning bolt b/c the mother-to-be is the president of the local Harry Potter Club). It turned out beautifully. Everyone kept asking me who made the cake and telling me how beautiful and delicious it was. The club that my friend is the president of is here in Orlando, the Orlando Harry Potter Club or OHPC for short. This is how we met and most of the people at the shower were members of the club. Well, while shopping, I saw a bunch of baby shirts and clothes that said things like "my aunt loves me" and "My grandma loves me." I decided to buy a onesie and iron on letters and create a onesie that said "The OHPC Loves Me," and I had a fabric marker there so that everyone could sign it. 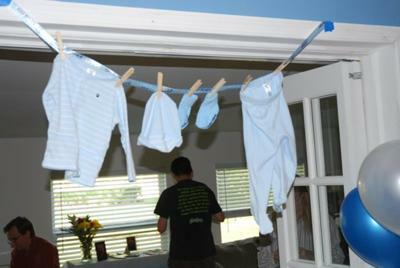 I also made a baby clothesline from ribbon and hung it in the house in the doorway between the two rooms where the party was held; it was in the perfect place and everyone commented on how cute it was. 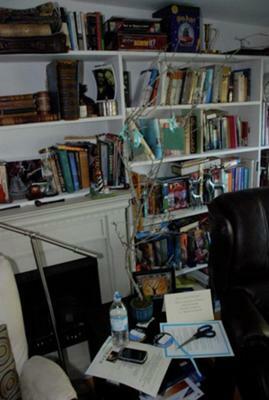 I also made a "wishing tree" for the baby with a tree branch in a pot, and I cut out little tags so that guests could write their wishes for the baby down on the tag and hang it on the tree. We played four games: "The Animal Baby game," "The Price Is Right," "How Big is Mummy's Tummy? ", and "Who Knows the Parents-to-be Best?" We got all of those game ideas from your site as well. 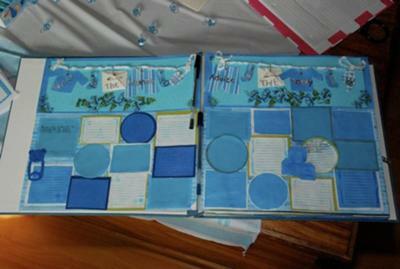 Lastly, I love to scrapbook; so I made a scrapbook for the baby and parents-to-be. I will upload all the pictures from the scrapbook, but at the shower it was open to a double page with "Advice for the Mommy-to-be" on one side and "Advice for the Daddy-to-be" on the other side so that guests could jot down advice inside it that they had for the future parents. The parents-to-be, my friends "oooed" and "awwwed" the entire time and could not believe how much time and effort I put into the shower. Everyone told me it was the best baby shower they had ever been to, and they told me how nice and pretty everything was. It really made me feel good, and I was just so happy that I could use my creativity along with your wonderful site to create such an amazing event! I uploaded as many pictures as I could, but I didn't have room to put the scrapbook pages, the clothesline,the edible cake or the wishing tree.